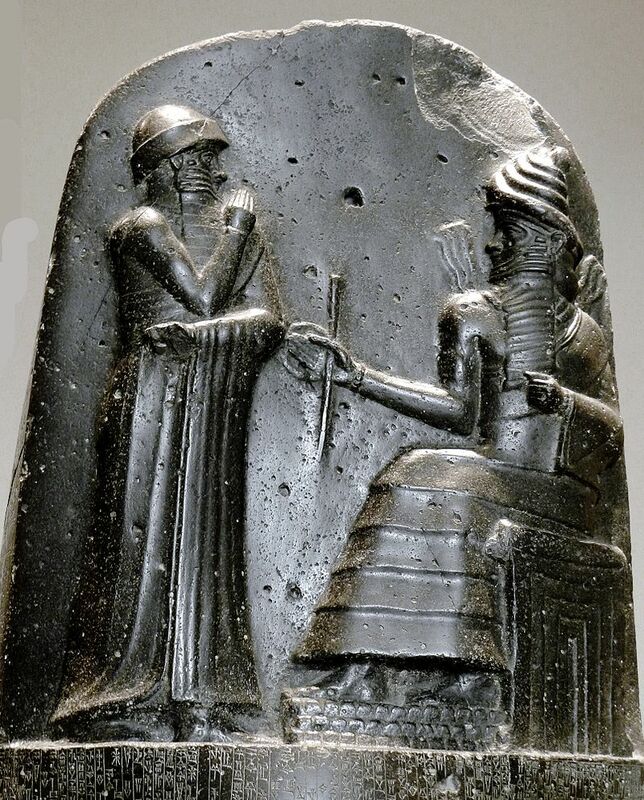 Hammurabi (standing), receiving his royal insignia from the god Shamash. (relief on the stele of Hammurabi’s Code, in the Louvre Museum, Paris). Hammurabi was the sixth king of the First (Amorite) Dynasty of Babylon. He reigned for 43 years — from 1792–1750 BCE – over most of ancient Mesopotamia. He is best known for the Code of Hammurabi — 282 laws covering everything from medical malpractice to a minimum wage. Contrary to popular belief, the Code of Hammurabi is not the oldest known written code of laws. That honor belongs to the Code of Ur-Nammu, written in the Sumerian language in Mesopotamia during the 21st century BCE. Unlike earlier legal codes, the code of Hammurabi was written in Akkadian — the daily language of Babylon. It was inscribed in cuneiform script on 12 baked clay tablets, as well as a seven-and-a-half-foot tall diorite (stone) stele, which originally stood in a public place where any literate person could read it. The stele – along with some of the clay tablets — now resides at the Louvre Museum in Paris. The code of Hammurabi differed in many respects from the Code of Ur-Nammu. Notably, it relied on the lex talionis, the law of retributive justice — “an eye for an eye, a tooth for a tooth.” The penalties in the code are harsh by today’s standards. For instance, if an improperly built house collapsed and killed the owner, the builder would be put to death. If the collapse killed the owner’s son, it was the son of the builder who would die. As harsh as the penalties could be, however, the accused had the right to a trial — unique in ancient times. He (or she) had the right to call witnesses, and was innocent until proven guilty. Bearing false witness was a serious crime. Those who brought false accusations were given the punishment the accused would have been received if found guilty. When guilt or innocence could not be established by hard evidence, Hammurabi’s code permitted “trial by ordeal.” One common method was trial by water, as seen in Law 132: “If the ‘finger is pointed’ at a man’s wife about another man, but she is not caught sleeping with the other man, she shall jump into the river for [the sake of her] husband.” If the wife drowned, she was guilty. If she survived, it was proof of her innocence. Her accuser would be put to death for having borne false witness. After Hammurabi’s death, the Babylonian kingdom largely collapsed. The stele containing Hammurabi’s code was plundered by the Elamites and taken to their capital, Susa (in modern-day Iran). It was rediscovered there in 1901 by a team of French archaeologists. Because of Hammurabi’s reputation as a lawgiver, his image is depicted in in several U.S. government buildings, including on a marble bas-relief in the chamber of the U.S. House of Representatives, with 22 other historical lawgivers, including Moses and Solon. This entry was posted in History, Law, The Middle East and tagged Akkadian, Babylon, Code of Hammurabi, eye for an eye, false witness, Hammurabi, lex talionis, Louvre, Mesopotamia, retributive law, Sumerian, Susa, trial by ordeal, trial by water, Ur-Nammu by Jackie Fuchs. Bookmark the permalink.